They say that the most beautiful things in the world cannot be seen or touched, they must be felt with the heart and this is the notion that the beauty of Los Roques inspires. A remarkable archipelago national park in Venezuela, Los Roques claims its superiority on being the largest marine park in the Caribbean. Simply stunning and exceptionally extravagant, Los Roques was declared a national park in 1972 because of its awe-inspiring beauty and ecological importance. Providing a natural habitat for a number of marine creatures, Los Roques is home to the some of the rarest fish species. While vacations are something we all cherish, when it comes to accommodations, tourists are always skeptical. This is because tourists believe that they are expected to pay handsomely for substandard facilities that are good for nothing but the situation takes a drastic turn when it comes to lodgings in Los Roques. Embodying utmost comfort and outstanding convenience, Los Roques strives to elevate vacationing experience for everyone. 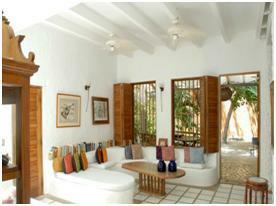 One such posada in Los Roques is Posada Mediterraneo. A world-class posada, Posada Mediterraneo has everything you need to make it a perfect home away from home. A perfect place for your stay, this posada is an amazing embodiment of charming indoors and breathtaking outdoors. While the Posada Mediterraneo offers opulence at its best, you can have the time of your life as you rest in the lavishly decorated room as you read an interesting book or surf the internet through the Wi-Fi service offered to all guests. Also featured here is an outstanding terrace that promises to ravish all your cravings with all the delectable and sumptuous meals that are offered here. From Latin American to Mediterranean, you name it and you will find the chef dÔÇÖoeuvres served to you. Engrossed in all the charm, Posada Mediterraneo is so lavish that it will coax you into visiting this hotel again and again. Offering vivacious vistas, just outside your window you can see all those white sand beaches, turquoise lagoons, palm trees resplendent in all their majesty. The peace and solace offered by this area is so overwhelming that you will wish to spend the rest of your life in this heaven on earth. Promising spacious rooms, outstanding amenities, it is for those who wish to be treated as royalty. Helping you experience new heights of excitement, Posada Mediterraneo is your chance of experience Los Roques at its best.